We all have a day in the week that we dislike, for most people its the Monday blues but for me its Â Wednesday or Hump day, that I struggle with. Then early this year I joined theÂ LadybirdÂ running club which meets on a Wednesday evening and it changed everything. The runs are in many places that I have never been so I am collecting a few new running routes too, tonight we were at West Lynn and almost 6 miles of road running was achieved. This entry was posted in Ladybirds, Running, Runs on May 15, 2013 by Sally. I have known about the Park Runs for some time now,having a special interest in theÂ Kings Lynn park run and the Cambridge park run. The problem is they involve doing 2 things I dont really enjoy, early morning running and a 3 lap route, but I knew when the time was right I would eventually do one. All the time I was running I kept thinking how much harder it was running at 9am, then when I finished and got my time I realised it might have been harder as it was my best 5k time at 29.11, a time that I think will be hard for me to better! I was very impressed with the organisation of the Kings Lynn parkrun and how quickly the results went up on the web site, its all run byÂ volunteers and is totally free too. Its going to be a while before I have the chance to do another parkrun but I will be back !! 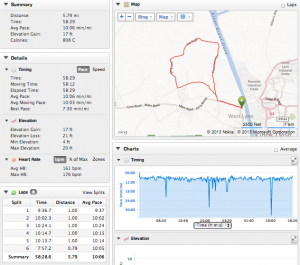 This entry was posted in Parkrun, Running, Runs on May 15, 2013 by Sally. Over the weekend I achieved the lastÂ challenge thatÂ I had set for myself while Geoff was away walking the South West Coast Path. The third was to walk 26 miles, which actually turned out to be a 32 mile day, as GeoffÂ enticed me into town with theÂ promise of dinner, amazingly my legs felt ok this morning, my toes just had a few hot spots. My Friend ,Gina also did the walk with me and she didÂ amazingly well as it was her first real walk, when you walk and talk the time and miles just disappear ! This entry was posted in fitbit, Runs, Walks on May 21, 2012 by Sally. 5 weeks ago, after annoying an oldÂ achilles problem while out running, I really thought I would not be able to do the Gear 10km Â run. I stopped running but carried on with my walking hoping that maybe this would keep me fit enough to run the 10km with no training. My usual running distance is 4 miles, and last week I did a 4 mile run to see how I felt,the day after myÂ achilles ached quite a bit and I was still unsure on what to do. This morning I was up early rubbing Nurofen gel onto my achilles thinking I would just run it gentle and set a time for the next 10km. MyÂ achilles did ache but never got any worse ! 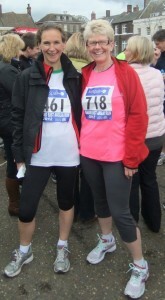 and I will be looking for another 10km to do later in the year ! 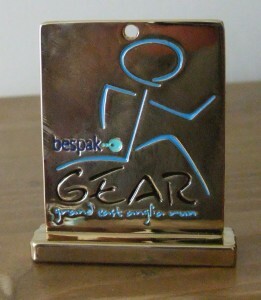 This entry was posted in Running, Runs on May 6, 2012 by Sally. For the past few months I have found every excuse I could think of to stop myself from signing up for a 10km run. First it was the cost, then it was Geoff Â would be away , then it was I would have no one to encourage me on the day and the list went on and on :-(Â and because of my dithering around I missed out on the 10km IÂ originally wanted to do. Then I realised if IÂ didn’tÂ act soon I was likely to miss out on the other 10km that I had my eye on, so I have now signed up for the GEAR 10km on May 6th. This week I have alsoÂ aggravated an oldÂ achilles problem 🙁 🙁 Â so there will be no running for me in the coming week ! This entry was posted in Runs on April 1, 2012 by Sally. A few months ago I was sulking, thinking my running days were over. I rested then went on my 260 mile walk ( sorry but I still cannot believe we walked that far), walking that far gave me time to re-think my exercise routine. The decision I made was to now concentrate on my running, walking and doing yoga at home. I started with a few two and a half mile runs but today I increased the distance to five and a half miles. It was made even more enjoyable because Geoff came with me too and the route along the River Cam is so beautiful in the morning sun. This entry was posted in Runs on November 27, 2011 by Sally. Even though the roads and pavements are still very icy and slippery in my village I just had to go for a run today. After a light covering of snow , the path we took across the fields was beautiful, it was like running on cotton wool. So the GPS said 1.78 miles …. moving average 5.3 mph and moving time 20.06 lots of room for improvement but at least its a start. This entry was posted in Runs on January 5, 2010 by Sally.